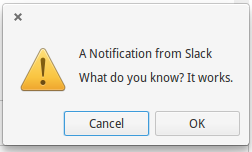 Suddenly nice top-right notifications stopped working for some apps (Slack and Music apps for example). An ugly and annoying traditional ok/cancel alert is being show instead. Fixes the issue until I restart the computer. Is there a way to change Notification Settings globally?